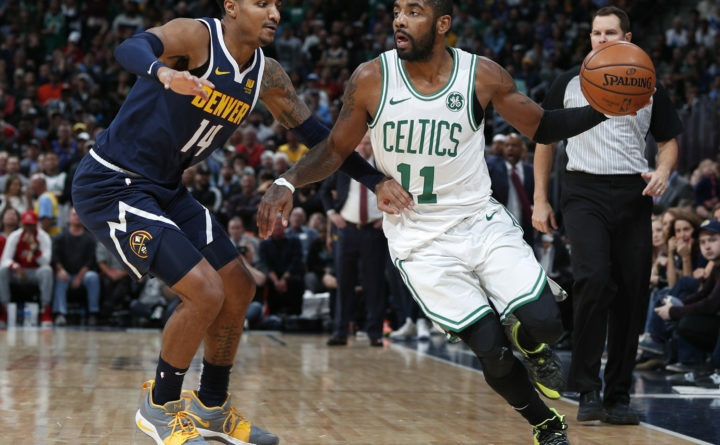 Boston Celtics guard Kyrie Irving, right, rives past Denver Nuggets guard Gary Harris in the second half of an NBA basketball game on Monday in Denver. The Nuggets won 115-107. DENVER — Jamal Murray simply got caught up in the moment when he hoisted a long shot with the clock winding down. Murray scored a career-high 48 points, including 19 in the fourth quarter, and the Denver Nuggets overcame a sluggish start to beat the Boston Celtics 115-107 on Monday night. In a matchup between two of the league’s top defenses, it was offense that ruled on this night. The Nuggets needed a big game from Murray because the Celtics found some rhythm. Malone knew it was just a matter of time before a streaky Boston offense started consistently knocking down jumpers. He was just hoping it would happen after Monday.